Today, we say goodbye to an icon of not just geek culture, but that of America and the whole world. Godspeed, Mr. Spock. Second star to the right, and straight on ’til morning. Edit: I now have the chance to sit down and write more. The Internet is filling up with tributes, and they’re nice to see. 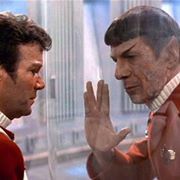 They’re filled with joy for what Nimoy had given us, rather than sorrow for what we’ve lost. And I rather like that. I’ve always preferred the Irish wake to the Roman funeral. I don’t really have anything to add that others aren’t doing better than I can. I made a quick post when I first heard the news (I was at the hospital), but I don’t see the point of sharing my story of Star Trek fandom. I grew up on Star Trek. That’s about it. Everything else is a variation on a theme we all know by heart. Right now what I’m thinking of is when Nimoy had to go through someone’s desk at Paramont and spilled green ink, and immediately left a note complaining of the sharp implements in the drawer, and saying he’d cut himself dangerously. That – THAT – is the joke one of us would make. Never a mundane. Leonard Nimoy, whatever else he was, was of our tribe. Nimoy wasn’t a one-trick pony, but he also didn’t mind being so associated with Spock. He enjoyed bringing joy, and that endeared him to audiences all over the world, in multiple languages. He truly made Star Trek enduring, because no other character caught the attention of the audience like Spock. Whether the center of the action or the foil by which other characters had their own moments, Spock was the show. And as much as I might rant (not always humorously) about how Vulcans don’t actually use logic and don’t you dare confuse the real debating tool with Spock, I don’t know quite where we’d be without him. Because without Spock, I don’t think Star Trek would have flourished. And without Star Trek, love it or not, where would science fiction be today? I don’t know if Nimoy thought of it that way, but he certainly had good humor about it. Why else would he stand up in front of an audience and give not one but two mock in-character debates with John de Lancie? Or this, the best car commercial in the history of geekdom? You get the feeling that it’s a fan film that had a car thrown in it to justify its presence on TV. So the more I’ve been thinking about it today, the more I think about the title of a movie. A title that was full of hope for a heartbroken audience, promising a return and a triumph. And I don’t think that search is quite over yet.